The governor's concept calls for the state to set aside $2.5 to $3 billion to hold employer rates steady. That sum would be front-end loaded with an $800 million down payment but the rest of the money could flow in over the next 14 years. "Tweaks to the PERS system will not set us on a path toward stability," Brown said in a statement. "We have had this problem for several years, and I am not willing to go another legislative session without taking significant steps to stabilize school rates and address the PERS unfunded liability." "Public employees provide extremely valuable services," Brown's chief of staff Nik Blosser says. "We need to stabilize their retirements. There is a deficit now and we need to equitably spread the burden of addressing that deficit. This plan does that." The governor's proposal comes at an opportune time. Public employee unions don't like those ballot measures, which would bite more deeply into the compensation of current employees than would Brown's proposal and begin a transition away from a defined benefit plan, where the state is on the hook for future payments, to a 401K-style plan, where the employee takes more of the risk. "We must protect the current PERS defined benefit plan and implement modest, dedicated employee contributions to secure each member's retirement," Brown said. "Over two-thirds of all public employees are now in the OPSRP or Tier 3 plan, and it is working well. It is both cost-effective for employers and provides a solid benefit for employees. I do not support changing this plan." 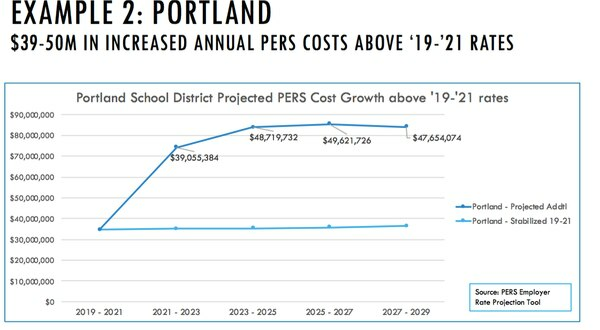 The governor's position is that if nothing is done, the rising cost of pension obligations will consume much of any new funding for teachers and educational services. Brown's plan begins with $800 million dedicated to the shortfall up front, then roughly $2 billion more over the next 14 years. 1. Retaining $400 million from an individual income tax "kicker" scheduled to be returned to taxpayers. 2. Transferring some or all of $486 million in excess reserves held by SAIF Corp., the state-owned worker's compensation insurer. "It is the height of fiscal mismanagement to on one hand say something must be done about the PERS unfunded liability, and on the other hand do nothing to stop the state from sending out over a billion dollars in tax breaks to wealthy Oregonians and businesses over the next 12 months," she said. Sweeping money from SAIF's reserves could anger companies that hope to benefit from those reserves in the form of lower rates or dividends from SAIF in the future. 2. The plan also calls for current employees to make contributions to pay down the unfunded liability. The governor's draft plan shows that employees in Tiers One and Two would pay 3 percent of their salary above $20,000 and Tier Three employees would pay 1.5 percent above $20,000. That employee contribution would bring in about $60 million a year. Employees would pay those contributions into "stability accounts" that they would retain ownership of, in effect reducing their take-home pay now but retaining their full pension benefit. Currently, the PERS liability is about 80 percent funded. When it rises above 90 percent, employees would no longer make the new contributions. "It's my hope is that people will consider the whole plan—not just parts of it—and see that we are equitably spread this burden," he says. "The governor is not predicating her support for new taxes with the passage of some version of the PERS stabilization package she's proposing," Blosser says. The PERS Coalition, a group of public employee unions reacted negatively to the governor's plan. "The proposal described today is a non-starter and lawmakers should reject it right out of the gate," said Patty Wentz a spokeswoman for the coalition. "It would be an immediate salary cut to the tens of thousands of teachers and public employees who educate our children, protect our safety, and serve our communities. This convoluted, confusing and ill-conceived proposal also raises serious constitutional and legal issues that would send the state into court for another lengthy and expensive lawsuit." Jenny Smith, a spokeswoman for the Oregon Education Association, echoed those sentiments. "We are shocked to hear of Governor Kate Brown's proposal to cut salaries for educators," Smith said in a statement. "At a time when lawmakers are finally making real strides toward investing in our schools, Governor Brown has decided to ask educators take a personal financial loss. 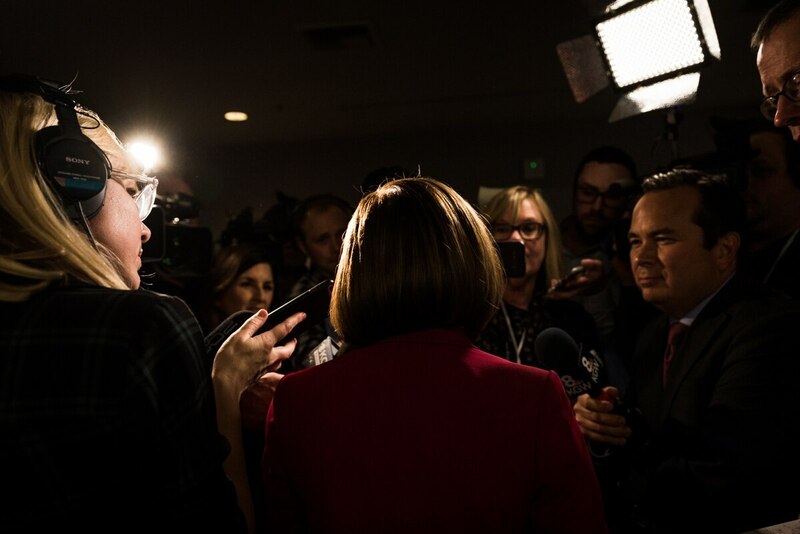 This is an unbelievable betrayal of the values all Oregonians hold." Mike Salsgiver, the Executive Director of the Associated General Contractors, Oregon-Columbia Chapter warned in statement that SAIF's reserves should be off limits. "SAIF's reserves are essential to protecting the safety of Oregon workers and ensuring low rates for contractors and other small businesses throughout the state," Salsgiver said in a statement. "You can be certain that raiding hundreds of millions of dollars from SAIF's reserves will negatively impact worker safety and accident prevention. That means higher rates for employers, reduced benefits for workers, or fewer investments in accident prevention. Any way you cut it, Oregon small businesses and workers lose." Oregon Business & Industry, which represents many of the state's largest employers, also pushed back on the possibility of using SAIF reserves. "We will strongly oppose this effort to raid SAIF to bail out PERS. The PERS solution should stand on its own," said OBI spokeswoman Samantha Tipler in a statement. Brown will present testimony on her plan to lawmakers in front of the Legislature's Capital Construction Committee at 1:30 pm today.